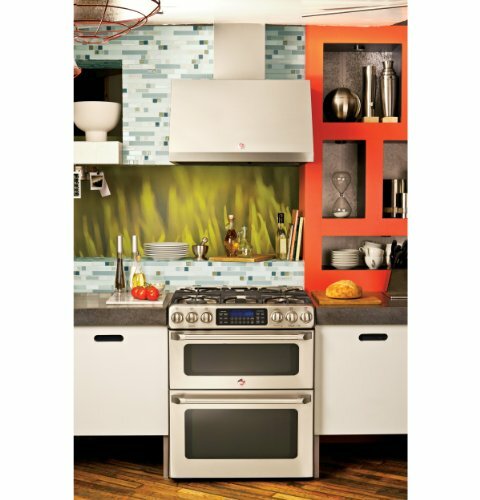 The GE Café CGS990SETSS is a freestanding gas range with a 5-burner oven from GE Appliances. 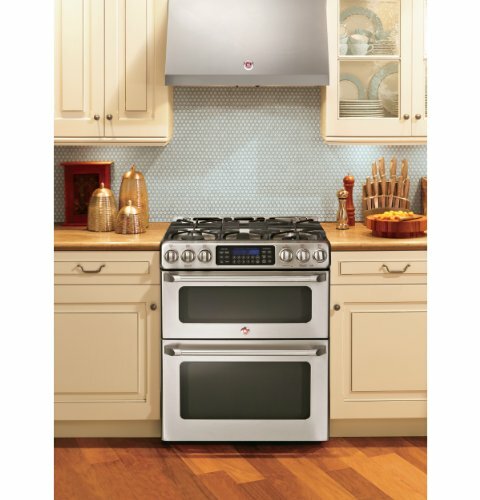 As a prominent member of the GE Café series, this stainless steel stove is advertised as a professional-level kitchen appliance aimed at enthusiasts or aspiring chefs who want a professional oven in their home. The CGS990SETSS comes with many features including a precise simmer burner, spacious 6.7 cu. ft. convection double oven and the popular self-cleaning mode. This is a 30” range from the back to the front including the knobs. Most slide-in range counter areas are cut for 25” so that the ranges stick out slightly. If your gas line sticks out quite a bit, that may push the range out even further. The range works with natural gas by default, aside from the convection oven, but also has the option of using liquid propane by utilizing a conversion kit located in a metal box at the back of the range. No matter which major appliance you purchase, some people may have issues. They can range from installation to manufacturing or simply improper use of the unit. There have been reports of gas problems with this series of ranges. We think that most of those issues can be resolved by contacting GE or the place where it was purchased. Here is a quick review demonstrating a properly functioning GE Cafe. One of the most interesting aspects of this range is that it has dual ovens with a 6.7 cubic feet total capacity. Both ovens are gas while the lower, and larger, oven also has convection ability. This might be one of the aspects why this Café range is recommended for people who cook a lot and are either professional chefs, or aspiring enthusiasts. If you tend to do a lot of cooking but feel that your oven’s capacity is sometimes not enough, this could be an excellent choice for you. The top oven has a broiling feature while the lower does not. Both ovens can keep your food warm for extended periods of time. This oven (or more like, ovens) could be a huge help around the holiday season when you have a lot of Christmas baking to do. With other ranges you often have to cook five or six different batches because you are limited to one or two baking sheets in your oven at the same time. When an oven has good insulation, the self-cleaning function can save you time and back breaking work. It lessens the need to spray and scrub by hand by baking the oven buildup in to ash. The angular design of the stainless steel cooktop contains spills much more effectively than flat styled ranges. Spills that are contained allow quick and easy cleaning. A lot of gas range ovens come with only four burners which are sometimes simply not enough. Not only does the GE Café CGS990SETSS has five of those, but that fifth burner is an oval form and much larger than your usual burners. The oval burner is most ideal for cast iron griddles, but also can be used for large or oddly shaped cookware. The range comes with a non-stick griddle but we prefer cast iron because it’s not likely to degrade with high heat. The GE Café CGS990SETSS is a stainless steel range that has all the basic features of most stoves. The double oven kicks it up a notch and offers more convenience. If you’re on a tight budget, this range probably won’t be for you. For some peace of mind, GE offers a 1 year warranty and you can fill out an application for an extended warranty. Depending on where you purchase this range, you might also be able to buy a 3rd party extended warranty. For those who have a more flexible budget, the stainless construction and double oven may make this a great investment. Of course you will have to ensure that you operate and take care of it properly. Did you enjoy this review? Let us know in the comments with your experiences with GE Cafe gas ranges.